Description: elongated and slender is the word for this Pterosaur. It features a long, skinny body ending in a small tail. Right under the tail it has a pair of thin legs with three claws on each. Two of these claws are poseable, with the third one positioned opposite the others, so the creature can grab things like human figures or small dinosaurs with these claws. On its left upper leg this critter is marked with a large black JP: Site B logo, numbered .22. The front part of the body ends in a thin neck with a large head on top of it: this head is basically a long beak on one end and a large pointy crest on the other. The Pteranodon has three small protrusions on each side of its beak. Next to these are a nostril, bright red eye (with a black iris), and small ear on each side of the head. Pressing the crest will open the animal’s beak, showing a large red tongue. Most noticeable are the wings of this Pterosaur. On each side of its body a blue clamp is positioned, to which a thick arm is attached, ending in four fingers, the last of which is very long and runs to the tip of the wing, where a small rectangular pin is found. The pins can be pushed into the small holes next to the creature’s legs, creating a wings-folded-in system. The wings can fold out by pressing the large button on the back, which also controls a flapping wings mechanism. The rest of the wings consists of a fine beige cloth, with a plastic strip in the middle of the wing holding it together. This creature sports a mostly beige paint job. It’s wings, arms, inside of the mouth and legs are painted in this colour, with the animal’s belly and throat coloured in a lighter shade of beige. The upper parts (back, upper tail, neck and middle part of the face) of the Pteranodon are painted in shiny blue, including the large button on its back. The beak and crest are painted yellow. This animal comes with two pieces of capture gear, both sporting an entirely shiny dark grey paint job. The smaller piece can be wrapped around the creature’s beak, right behind the protrusions which make sure the piece doesn’t fall off. The other piece can be clamped around the Pterosaur’s legs and tail. Analysis: with regard to the Pterosaur figures, this is a rare case in which Hasbro’s figures are more realistic and playable than Kenner’s. The JPS1 Pteranodon wasn’t a great figure to begin with, and this larger Pteranodon, almost twice as big, isn’t much of an improvement. First of all, the paint job, though somewhat resembling the colours of the Pteranodon seen in the TLW movie, isn’t appealing. The beige is quite bland. The yellow on the head sculpt looks a bit silly, especially since the Pteranodon already has a goofy face (those eyes look ridiculous). This sculpt could have used a more elaborate and detailed paint job. Second, the wings. They are too small, and though the cloth is a nice touch, it’s more susceptible to damage and dust. It gets spotty quite easily (in my case my cat once puked on it, after eight years the stains are still there…). Also, the arms are way too thick compared to the rest of the body, and thanks to the extra strip of plastic in the middle of the wings this figure has a sort of bat like quality to it, unlike real Pteranodons. The clamps next to the body make the wings look fake. The capture gear, as if often the case, doesn’t add much either. You can put it on the animal but it’s hard to find other uses for it. The Pteranodon can rid itself of the beak piece by opening its mouth a few times so it slips loose. There’s no breaking-free action for the other piece. We’re to believe the V-shape structure of this piece causes the wings to stay folded in, but when the button is pressed the wings fold out: the animal can just take off and leave, it seems. Still, this figure has some redeeming features. The claws on it’s feet are neat and can really hold a figure tight. They’re strong enough, so when “in flight” the figure doesn’t shake loose and fall to the ground. The flapping wing mechanism works better than the one the JPS1 Pteranodon featured, though as far as accuracy is concerned it’s commonly believed Pteranodons were gliders; their size made it hard to fly through flapping their wings, and they used air lifts and wind to glide instead. The unfolding system is a bit odd; though in real life Pterosaurs could fold their wings in some fashion too (in order to walk using their hands), it would probably not be very healthy for a Pteranodon to fold its wings in this position. But the unfolding looks cool, and it saves space when the creature’s wings are folded in. However, the right wing has some problems folding out sometimes, because the right leg gets in its way. Playability: this figure provides for more playability options than you might be inclined to think. It has poseable claws and legs, its mouth can be opened, its neck twisted 360 degrees. The flapping mechanism works fine, and the folding of the wings is an interesting additional option. Added to this are the two pieces of capture gear, though their use is very limited. Realism: like stated earlier, this sculpt does resemble the Pteranodons seen in the TLW movie to some extent. It has a similar paint job, though a lot less detailed of course. It’s also a slender skinny animal, as it was in the film. However, the wings are totally off: for one thing they should have ended on the base of the legs instead of halfway across the flanks. Its legs and claws are also disproportionate, as is the case with the head, which is just too big. Its crest has a different shape. Compared to human figures, this Pteranodon is somewhat oversized. 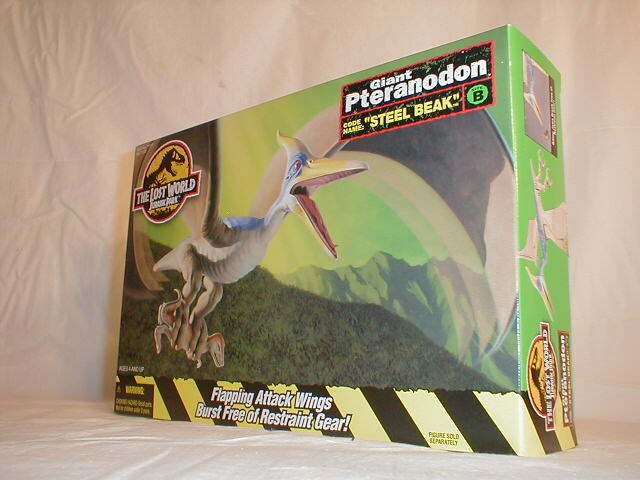 Maybe that’s the reason this model is called Giant Pteranodon. Repaint: partially. The capture gear and the creature’s head are new, but the rest of this Pterosaur’s body is a repaint of the JPS2 Quetzalcoatlus. It would not be repainted again. Overall rating: 5/10. Though it has some fun action features, this sculpt isn’t very good. It’s not rare and can probably be found quite cheap, but my advice is to go for one of Hasbro’s various Pteranodons instead (undoubtedly the only time I pick Hasbro’s work over Kenner’s). Still, if you can get it for little cost it may be worth it.